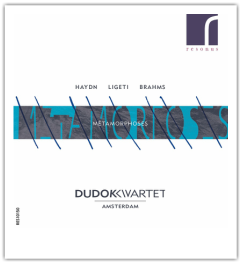 In June of 2013, the Dudok Quartet has finished their studies at the Dutch String Quartet Academy with highest distinction. Due to their successes at international competitions, the quartet has been recognized one of the most promising young European string quartets. The Dudok Quartet was finalist and laureate of the 7th international string quartet competition Quatuors à Bordeaux in May of 2013. Furthermore, the Dudok Quartet has won 1st prizes at both the 1st International String Quartet Competition 2011 in Radom (Poland) and the 27th Charles Hennen International Chamber Music Competition 2012. In November 2012 they received the 2nd prize at the 6th Joseph Joachim International Chamber Music Competition in Weimar (Germany). The members of the quartet first met in the Ricciotti Ensemble, a Dutch street symphony orchestra. Since January 2009 the ensemble consists of its current members. From 2009 till 2011 the Dudok Quartet studied with the Alban Berg Quartett at the Hochschule für Musik in Cologne. After that, they studied with Marc Danel at the Dutch String Quartet Academy. During the same time, the quartet was coached intensively by Eberhard Feltz, Peter Cropper (Lindsay Quartet), Luc-Marie Aguera (Quatuor Ysaÿe) and Stefan Metz.